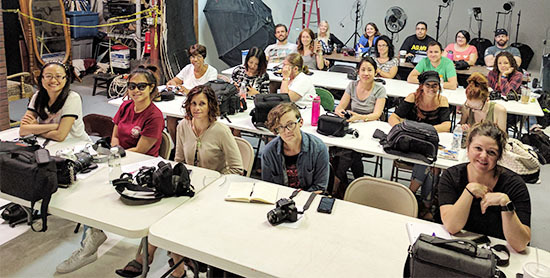 Last weekend’s students beating the heat in a full Intro to Photography DSLR class! We offer this core class ongoing and multiple times a month because of its popularity and success in teaching everything needed to start out in photography or taking your skills to the next level! In addition, we offer our core photography classes and all of our specialty photography classes as private lessons if you prefer a more one-on-one learning experience! Sign up for a class and take your photography skills to the next level! In addition, we offer gift certificates which would make a perfect holiday gift for that special someone in your life!